What Will the Battlefield of the Future Look Like? In sci-fi entertainment, military engagements of the future often look supremely, well, futuristic, with orderly lines of armored troops firing bright lasers at each other across a clear, well-defined combat zone. But according to U.S. Marine Corps and Navy Officers with the Marine Corps Warfighting Laboratory (MCWL) in Quantico, Virginia, the real battlefield of the future will be far less defined — and far more complicated. The defining aspect of the battlefield of the future will be its environment, and its distance from traditional bases and HQ infrastructure. According to Lt. Cdr. David Gribben, who heads up the MCWL Expeditionary Medicine Portfolio, Marines of the future will be stationed on floating sea bases, and will be inserted ashore, likely via unspecified next-gen versions of the Amphibious Assault Vehicles (AAVs) or MV-22 Osprey tiltrotor aircraft that Marines have used for some time. “They’re going to go in very light [i.e. with a minimum of gear] … into very hostile, lethal environments,” he said. America’s most recent wars, in Afghanistan and Iraq, are atypical from what we can expect in the future. Despite the severity of those conflicts, the fact remained that there were world-class facilities within a quick flight from the battlefield that Marines could return to and recover. That won’t be true in the future, as Marines more frequently will be engaged in “crisis-response, limited-contingency fights ... with very, very basic resources,” as Gribben said. In these austere, forward (near enemy lines) environments, Marines will have with them only what they can carry on the aforementioned AAVs or MV-22s. Thus, reducing battery size and increasing battery capacity, as well as improving the power-management systems on the smaller vehicles Marines use (such as ATV-type vehicles) will be of utmost importance. The technological march forward in the civilian sector already is taking care of a reduction in the size of lithium batteries, but Gribben believes that power-management systems, which reduce energy consumption and extend battery life, “are where we’re going to make our money.” These solutions, one example of which is increasing the size of the alternator on the vehicles, “aren’t glamorous, but certainly give us higher efficiencies,” Gribben said. Battery size isn’t the only thing that will be smaller on the battlefield of the future: So will unit size. In the future, relatively compact 100-person units will be distributed across a field of operations. “You’ll have platoon-level efforts, alone and unafraid, across a battlefield of anywhere from three to 10 kilometers,” Gribben said. 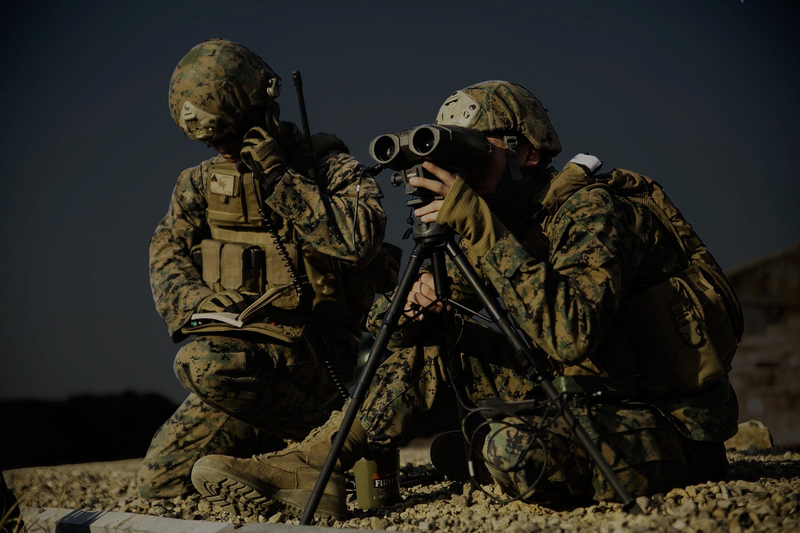 Since the Marines have historically been the smallest and most agile branch of the military, this “muscle memory” will allow them to adapt even more skillfully to these smaller-unit challenges. Smaller units are desirable in that they can respond more quickly and be more targeted, with less of a logistical footprint. But it’s not possible for units of that size to have with them an expert in every possible situation or skill. That’s where Capt. James Piniero, who leads ground robotics technology development for the MCWL, and his team come in. The farther out you can see or sense a threat, the more time there is to make a decision on what to do about it. Technology is a barrier to entry, but so is an organizational model that largely stems from World War II. “Right now a lot of these [autonomous systems] are not organic to an infantry battalion,” he said. Part of this is due to the resource constraint that comes with requiring someone in the unit (or multiple someones) to have expertise in the robotics systems that are being deployed. In the future, Piniero expects for robotics operation to become an official Military Occupational Specialty, or MOS, within the Marine Corps, which currently it is not. One way this might manifest itself is in long-range teleoperations, which looks at controlling a ground robot from a displaced location, similar to how larger airborne drones operating in, say, the Middle East are controlled from a Stateside base. Ground robots are of course not the only robo-companions that Marines will have in years to come. Large unmanned aerial vehicles, or UAVs, such as the Predator drones that are used to take out terrorist targets, are already fixed in the imagination of the public. But on the battlefield of the future, the UAVs accompanying Marine units may look much more similar to the simple quadcopters that hobbyists send aloft in parks and fields. Marines prep an RQ-7Bv2 Shadow unmanned aerial system for launch. Source: Lance Cpl. Harley Robinson via The United States Marine Corps. 3D printers could someday print UAV parts for Marines. Source: Jonathan Juursema via Wikimedia Commons. In the future, these machines may not come from a factory in the U.S., either — or at least not all of them. Moore is interested in how 3D printing could contribute. She said, “If you had a 3D printer that was in a safe location overseas, you would maybe be able to take an order for a part or the main platform, and then have some of the small UAV engines and payloads to be able to slap onto it.” That would provide a clear reduction in logistical requirements, especially in austere forward environments. It’s clear that future Marines will be facing an even more demanding battlefield than what they experienced in Iraq and Afghanistan. So it is imperative that the technology they have to support them keeps pace. This post is a sponsored collaboration between the U.S. Marine Corps and Studio@Gawker.